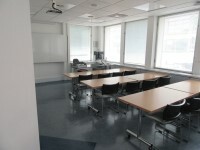 Eleventh Floor: Centre for the Analysis of Time Series. 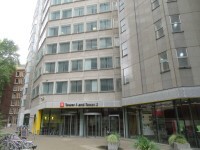 The LSE campus is located in central London, off Kingsway (A4200) and the Aldwych (A4). This campus does not have its own car park, but Blue Badge and standard on-street parking is available nearby. The campus can be accessed via a number of London Bus routes, including bus 1 (New Oxford Street to Canada Water Bus Station), 59 (Streatham Hill to Kings Cross Station), 68 (West Norwood to Euston Bus Station), X68 (Croydon to Russell Square), 91 (Crouch End to Trafalgar Square), 168 (Royal Free Hospital to Old Kent Road), 171 (Catford to Holborn Station), 188 (North Greenwich Station to Russell Square Station) 243 (Wood Green to Waterloo Station) and 521 (Waterloo Station to London Bridge Station). The nearest railway station is Charing Cross. 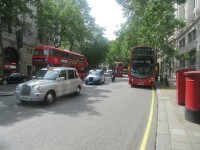 However, all of the London Terminal stations are within reach of the campus using public transport. The nearest tube stations are Holborn on the Central and Piccadilly lines, Temple on the District and Circle lines, and Charing Cross on the Northern and Bakerloo lines. 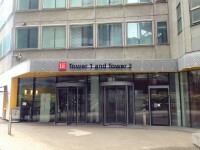 For more information, please see the Travelling To LSE page on the University Website. Please see the Transport for London website for more details on travelling to the LSE by bus or tube. Please see the National Rail website for details of trains into London. To see more information on Student Services Centre please click here (opens new tab). 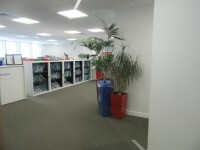 Telephone Number: 020 7955 6167. To see more information on Undergraduate Admissions Office please click here (opens new tab). Telephone Number: 020 7955 7125. 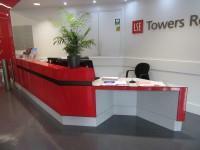 To see more information on Postgraduate Admissions Office please click here (opens new tab). 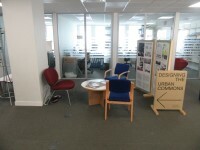 Telephone Number: 020 7955 7160. To see more information on Residential Services Office please click here (opens new tab). Telephone Number: 020 7955 7531. A key card with the relevant permission is required to operate the automatic door. 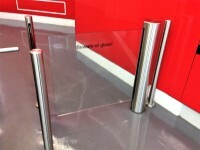 Visitors can use the push pad to alert reception to open the door for entry and exit, the pad is 78cm high. 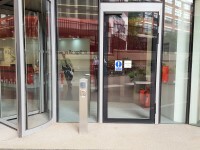 There are 2 sets of heavy manual revolving doors to the left of the accessible door. 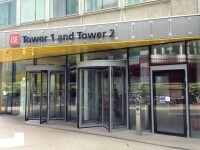 Towers 1 and 2 share the same entrance. 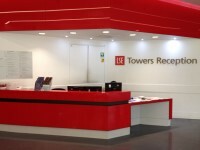 Tower 1 is to the right as you enter the reception (as shown in photographs 5 and 6). 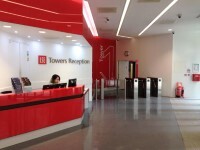 Tower 2 is to the left as you enter the reception (as shown in photographs 7 and 8). 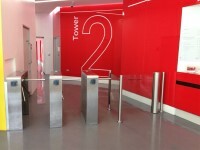 There are security barriers operated by key card with a height of 88cm and an accessible security barrier operated by reception staff to gain access to Tower 1. 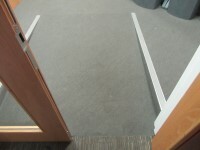 The accessible barrier is located to the left of the security barriers and has a width of 92cm. 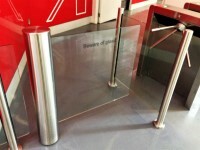 There are similar security barriers to access Tower 2, the accessible barrier is to the right of the security barriers and has a width of 92cm. 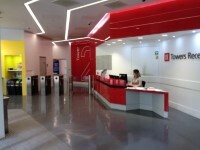 The reception is staffed 24 hours a day. 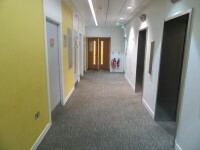 The Building Reception is located directly ahead as you enter the building. 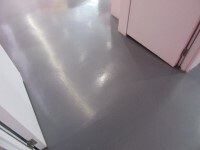 There is a clear knee recess beneath the low counter. 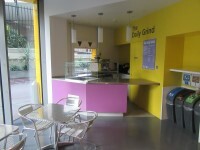 You are on Eating and Drinking (The Daily Grind). Skip to the next section. 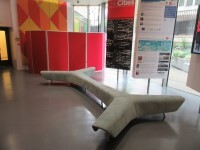 The nearest table is 2m (2yd 7in) from the main entrance. Plastic / takeaway cups are not available. The type of food served here is hot and cold drinks only. 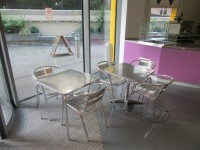 This cafe is located in the entrance foyer. 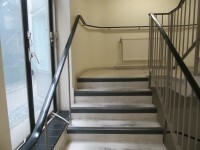 There is an easy slope, with no handrails, for access to the lift lobby on the ground floor. 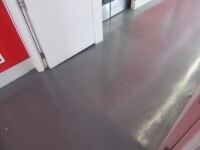 This level change can be seen in photographs 1 and 2. 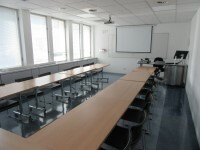 There is an easy slope, with no handrails, for access to the seminar rooms on the third floor. There are identical level changes in the same location from the third floor upwards. These are located to the left as you exit the lift. This level change can be seen in photographs 3 and 4. 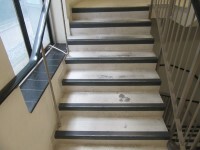 The floors which are accessible by stairs are G-1-2-3-4-5-6-7-8-9-10-11. The lift is located to the left as you pass through the security barriers. 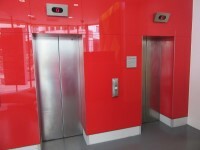 The floors which are accessible by this lift are G-1-2-3-4-5-6-7-8-9-10-11. 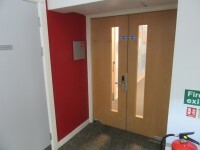 There are manual, heavy, double doors to access the lift lobby from the first floor upwards. 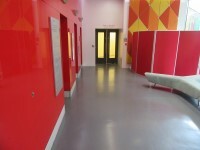 The lift is approximately 10m (10yd 2ft) from the main entrance. 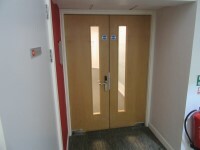 The clear door width is 76cm (2ft 6in). 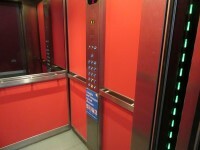 The dimensions of the lift are 131cm x 142cm (4ft 4in x 4ft 8in). 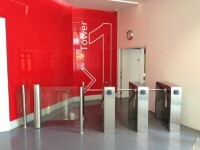 You are on Entrance (Tower 2 Access). Skip to the next section. 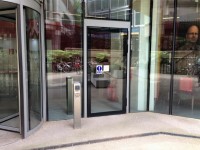 There is one set of manual, heavy, double doors between the Tower 1 lift lobby and this entrance. 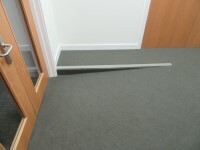 The width of the door opening is 127cm (4ft 2in). 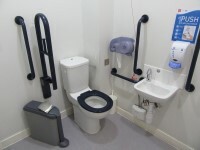 This accessible toilet is approximately 2m (2yd 7in) from the first floor lift lobby. 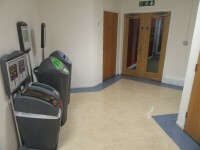 This accessible toilet is located adjacent to the standard male toilets on the first floor. 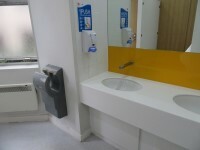 There are identical accessible toilets in the same location from the first floor upwards. 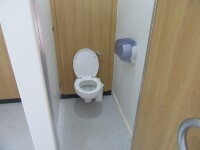 The dimensions of the accessible toilet are 149cm x 220cm (4ft 11in x 7ft 3in). 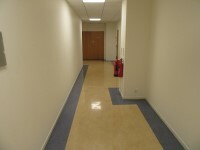 The toilet surveyed is located off the first floor lift lobby. 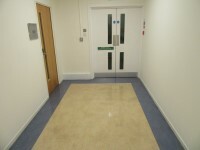 The standard toilet surveyed is approximately 5m from the lift.